Melted white chocolate adds its distinctive deliciousness to this smooth, creamy cheesecake. 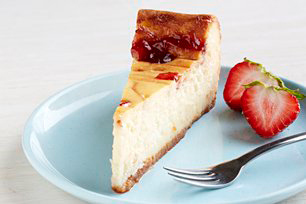 Top with strawberry jam, and you've got a winning cheesecake recipe. Meanwhile, beat cream cheese, sugar and vanilla in large bowl with mixer until blended. Add chocolate; mix well. Add eggs, 1 at a time, mixing on low speed after each just until blended. Pour cream cheese mixture over crust. Top with small spoonfuls of jam; swirl gently with knife. Bake 50 to 55 min. or until centre is almost set. Run knife around rim of pan to loosen cake; cool before removing rim. Refrigerate cheesecake 4 hours. Prepare using Kraft Pure Raspberry Jam.